Here’s a full history of the Census Bureau’s figures for median household income. 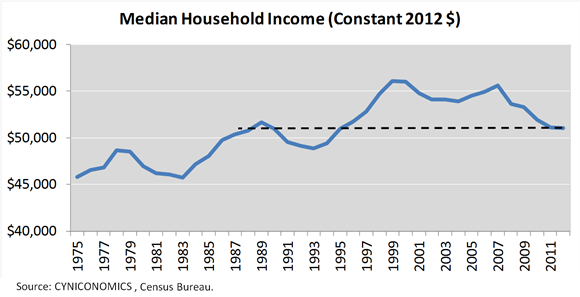 Notice that median household income in 2012 is below the 1989 figure. That’s 23 years. Not so good. Now let’s look at things from 1975, which is the begining of these records…..Median household income has increased by a cumulative, grand total of 11% or $5,229 over 37 years (from $45,788 in 1975 to $51,017 in 2012). Remember, we’re talking total household income here. Pitiful to say the least! But this is where things get interesting…in 1975 a Member of Congress (House of Represenitives and Senators) recieved pay of $44,600 and the median household income was $45,500, Let’s push ahead to 2012, actually 2010 is the latest data available for Congress, and we see a Member of Congress had a pay of 174,000 (according to the Congressional Reasearch Service) vs median household income of (approx) $51,300. So, while the rest of use pinions had a raise in our total household income of 11% all total since 1975, our finest men and women of Congress (bums) saw an increase of 339% in their income! In addition to this, our finest in Congress excluded themselves from Obama Care, yep, but we are saddled with it, and they exluded themselves from the laws of stock insider trading! Yes, they are allowed to trade and profit from stocks on non public information. Get out the pen and send off a copy of this report to your Congress person! Let them know just how mad you are.